A close, tense affair. The French prevented the Rifle unit even getting a shot off and then attacked the town to take him out. 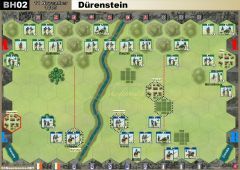 As a result the Allies refused the centre and left flank, causing the French to switch operations over to the other flank. 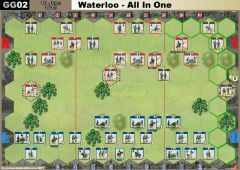 The French had great rolls with a single die all day, but it didn't look like being nearly enough when the Grenadier Guards led a counterattack which killed off two units and two leaders. 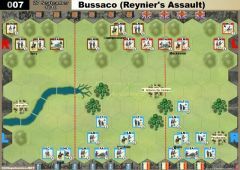 A Bayonet Charge back stabilised the French line, and the transfer of a LC unit to the left from the right flank proved key. Also, a timely artillery bombardment on the Guards effectively put them out of the rest of the game. 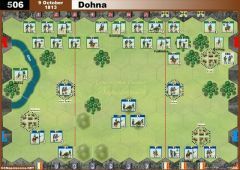 Both sides kept picking off units though and it was 5-5, then 6-6, and a desperate struggle for the last banner. It came courtesy of an artillery attack on a reduced square. An excellent game ... it's always a pleasure to play against Steve. The return leg is on Thursday, 8am PCT, 3pm CET. This is a fun scenario. Our match should be called single die fun. Tony hit on 10 out of 11 single die rolls three of them where Cavalry hits and one leader kill, I got one too and a double sabre kill too, bad day for leaders. Tony played a great game congrats. Another French win. This time it was a very different battle. 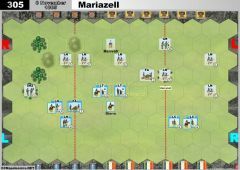 A French Force March followed up with an Elan put the banner count at 2-0 French. Later a Arty Canister from a one block FA made it 2-2. A rally made the FA whole again in time to maul a French LC. 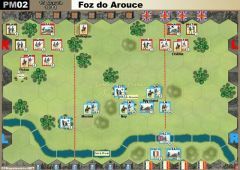 Taking out the French LC left the Allies in a strong position on the French right forcing them to retreat and the match at 3-2 Allies. 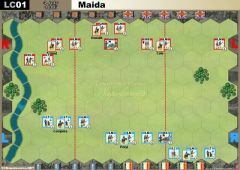 A French Bayonet Charge weaken the British. Now it was the Allies using a Bayonet Charge to get to better defensive positions. 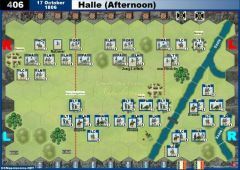 The French counter attacked leaving several one, two, and three block units. 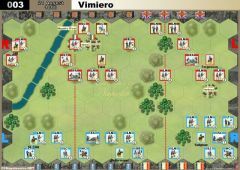 With the action only being in the center and French right the whole game both hands where full of left cards. Renewed pressure from the French made it 4-3 French. French Leader Simon pushed up the center making it 5-3 French and the Allies out of cards to escape. 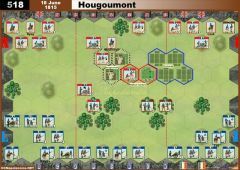 The French won by assaulting a two and a one block units. 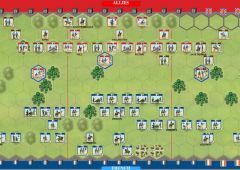 A Force March and three Bayonet Charges really helped the French. Tony played well especially with the tactics cards, thanks again for the fun games. Steve played this one very well. As he had done in the first game, I should have ran with my RI and LT back to the rear. That would have saved those units and given me time to build up a decent hand. As it was, I was firefighting all the time and couldn't therefore get rid of my Right Flank cards. 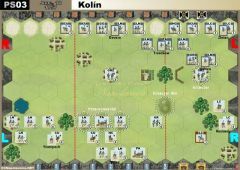 As the death approached I had 5 Right Flank cards and a Cavalry Charge. No good when I was needing to defend in the Centre and Left Flank. As I said, all that might have been avoided had I ran in the first place to buy more time. But whatever my mistakes, Steve played a good, patient game, and deserved to win over the two legs.